On our first day, we travelled by Eurostar and arrived at our destination late afternoon where we met our enthusiastic French animateur. 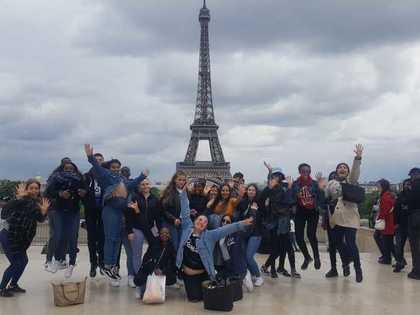 In the evening, firstly we headed to the residence’s restaurant to enjoy the amazing French food and afterward students were put into teams to play entertaining games using French only. On the second day, we started by visiting the world’s most visited art-museum in the world, Le Louvre. Students were really thrilled to see the famous Mona Lisa painting ( La Joconde) and some of the hundreds of thousands of classic and modern masterpieces, such as the Venus de Milo, Ramses tomb and many others. We then walked to the famous avenue of Champs- Elysées where we saw one of the gates that leads to Emmanuel Macron’s presidential house as well as the several renowned designer shops. At the western end of the Champs-Élysées we admired the Arc de Triomphe where beneath its vault lies the Tomb of the Unknown Soldier from World War I. After a break to recharge batteries, we finally arrived at Champ de Mars where the symbol of Paris was built: the Eiffel Tower. We ended our day with a cruise on the Bateux- Mouches to get a view of the city from along the river Seine. On the third day, our students were welcomed by their French pen pals at a secondary school called Lycée Notre Dame de Bossuet. Students had the chance to put in practice their linguistic skills and also the chance to enjoy homemade French food prepared by their pen pals. In the afternoon, we visited the most visited tourist attraction: Cathedral Notre-Dame de Paris. It was a chance to appreciate its stained glass, rose windows, the towers, the steeple, the gargoyles and a time to pray and lit a candle for our loved ones. 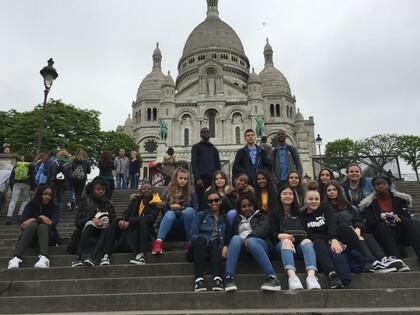 After the Notre Dame, we climbed the stairs to the beautiful white Basilica of Sacré Coeur located in Montmartre. In the past many artists such as Salvador Dali, Claude Monet, Pablo Picasso and Claude Monet had studios or worked around this community. The artists’ square has many painters and caricaturists that are always equipped to make a portrait or caricature. We ended our day at the accommodation with a challenging quiz about all locations and monuments visited during the day. The last day of the trip was mainly dedicated for shopping of French delicacies and souvenirs in the popular Rue Montorgueil; a half-market, half foodie paradise shopping street filled with flower vendors, rotisseries, tempting bakers and fragrant cheese shops. Before we left, we also visited a local supermarket.